For over three generations we’ve been your go-to New York RV dealer. From travel trailers to motorhomes to RV service, we’re proud to serve your RVing needs. And, we’ve taken note that you love us, which is why we’re proud to open a new Churchville facility! After 9 months of construction we’re now ready to serve you even better than before! 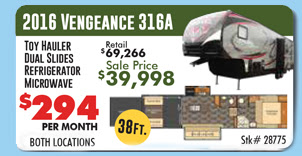 The 2016 Vengence 316A is a spacious toy hauler that boasts dual slides, a refrigerator, microwave, and an impressive 38 foot long body that offers tons of space. get it now for $294 a month at either of our locations. Looking to simply hop in your RV and hit the road. Check out the gorgeous Sunseeker 2650 class C motorhome. It features a single slide to expand your living space, a rear bedroom, fridge, microwave and three burner range. This motorhome retails for $91,056, but is now available for $69,998. 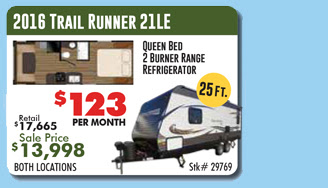 Lightweight and affordable, the 2016 Trail Runner 21LE boasts a queen sized bed, two burner range an refrigerator. At 25′ long it’s easy to tow, yet manages to provide a wide range of features you’d expect to pay more for. For the cost of dinner out a couple times a month you can enjoy the freedom of RVing! Stop by our new location or contact us with questions. We’re here to help you find the best RV for your needs.